-- For weeks they've sat there -- he in plentiful locks tucked inside a black mesh Rasta hat, she in a black scarf covering her hair, ears and neck -- on the back row of the courthouse room where the D.C. sniper trial is being shown to reporters on closed-circuit television. They watch the proceedings intently, scribbling notes and occasionally exchanging discreet whispers, but never mingling with the other journalists chronicling the fate of alleged sniper John Allen Muhammad. When asked, they curtly respond that they are from the Underground News Network, but offer little else. There are reasons for this. The couple dozen or so journalists surrounding them each day are the very "vultures who wish to see John Allen Muhammad hang from the gallows of The Commonwealth of Virginia," as the pair wrote in last week's Internet account, and a large part of the reason they drove their white Ford pickup all the way from Florida to be here. In monitoring "the so-called professionals that the masses depend on to deliver the daily news," the Underground News Network's editor in chief, Ital Iman I, and executive editor and Webmaster Da.Uru I hope to offer "spiritual support" to John Allen Muhammad, who they say was chosen by higher forces to deliver coded messages to the world. With execution lust raging in this coastal town and hardly a friend, family member or supporter in sight, Muhammad sure could use the help -- that is, if he even knows the UNN is out there, waging this spiritual battle on his behalf. The sniper shootings were "like a message from a high priest, this initiation rite to take the world, especially black people, to a higher level, to get a higher consciousness," says Iman I, who is 46. So instead of zigzagging through parking lots and ducking behind gas pumps during the terror spree that left 10 dead last October, he says, Washington area residents should have been listening to Muhammad's missives railing against racism, corporate greed and anti-Islam sentiments. But only the seers can read through the mysticisms that accompanied Muhammad's mission: The "duck in the noose" phrase that Chief Moose recited at the snipers' request. The tarot card left at one shooting. The notes demanding that police call the snipers "God." That's where "Word is Bond: Essaic Manifesto: The document containing the Doctrine in support of John Allen Muhammad/John Lee Malvo, " a 35-page pamphlet that UNN published, comes in. So far, they say, they've sold about a hundred copies through the Internet and independent bookstores for $23 -- as in 23 days of terror. After Monday's proceedings, they have agreed to be interviewed in a sub shop across from the Virginia Beach Municipal Center. They decline to order anything, even water, as the Rastafarian couple who also follow some of the teachings of Islam are vegetarians who don't trust food they have not prepared with their own hands. They are soft-spoken and polite as they talk about their journey here. "The mainstream media were not telling exactly what is going on in the courtroom," says Da.Uru I, who is 30. "They are saying that they caught Muhammad, but he actually led them to him." Thus the phrase "we have caught the sniper like a duck in a noose," meaning Muhammad would be waiting when police came for him and he would not run. It was all in the divine plan. During the three weeks, Iman I saw other signs. The four gas stations targeted represented the four big oil companies. The tarot card left for police was the 13th card of the deck corresponding to death, and it alluded to the 13-year-old boy shot at the school as a warning to the government that schools should be places of learning. The numerical links he makes, from Muhammad's birthday, the ages of the victims, to the dates of the shootings, go on and on. "You have two black men who have held the nation at bay for 23 days," Iman I says. "That hasn't happened since Nat Turner. Whether they killed them or not, you have to admit that he's an intelligent man. It's the trial of the century -- it's actually bigger than the O.J. trial." At the time Iman I started putting the pieces together last October, he had already been hosting a radio talk show based in Jacksonville and publishing a newsletter covering American Beach, the historically black resort town on Amelia Island where he and Da.Uru I live in "a small commune of nine consisting of two wives, a husband and six children." So he decided to fold the radio show and newsletter and his interest in the Muhammad case into a new Web site called the Underground News Network. Iman I tried to share his revelations with Muhammad soon after his arrest by mailing some of his writings to the Virginia jail where he was held, but officials returned them unread, stamped "inappropriate contact." So Iman I published the "Word is Bond" pamphlet, and along with Da.Uru I, headed up to Muhammad's April pretrial hearings in Prince William County. But they never got that far. En route, police pulled over their 1998 Ford truck for a traffic stop on Interstate 95 in McIntosh County, Ga., and arrested them for possession of less than one ounce of marijuana, which they say they use for religious purposes. But before they were taken to the jail, they say, officers from several law enforcement agencies swarmed the car. During the stop, an FBI agent seized copies of their "Word is Bond" pamphlet, along with other writings including "Fire in Dub," "Anatomy of a Revolution" and "Of Prose and Con," according to a receipt of the seizure that the couple kept. After being questioned for several hours, they were released on bail. When they returned to court in June, charges against Iman I (aka Noel Jones) were dropped, while Da.Uru I (aka Chineka Whitaker) was charged with possession of marijuana and sentenced to 12 months' probation, suspended upon payment of a $500 fine, according to court records. They say they are still waiting to get back their pamphlets. Iman I and Da.Uru I were outraged enough to send out a press release called "FBI Targets Rastafari Journalists" -- "Was this a conspiracy to keep the journalists from the trial of John Allen Muhammad?" -- but were otherwise undeterred. It, too, was part of the plan, they say. They drove up to Virginia Beach to cover the trial last month with hopes of telling their Internet readers the truth about the trial and the parable of the divine shootings, which will become grist for the next pamphlet. They live simply and eat inexpensively -- mostly Chinese noodles and seaweed -- and live off the proceeds of their sales of their pamphlets, and their arts, crafts and jewelry, which they sell at independent shops. 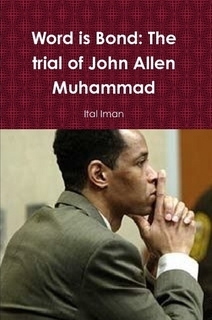 They vow to see the end of the Muhammad trial and that of his "student," Lee Malvo. They don't condone killing, but believe Muhammad and Malvo should not receive the death penalty if convicted. They say racial justice dictates that the names John Allen Muhammad and Lee Malvo, "revolutionary black men," get equal billing with white criminal masterminds such as Jeffrey Dahmer, Charles Manson and the Son of Sam, who "have had movies glorifying their sick works." There hasn't exactly been a stampede to the Web site. Yesterday morning, the forum on the Muhammad trial had received fewer than 1,800 hits since Sept. 25. But UNN dispatches have been picked up at several other underground media sites, where in at least one quarter, they've struck a nerve. Soon after the Underground News Network began publishing its trial coverage, criticism came from the Matah Network, an Afrocentric marketing network co-founded by Ken Bridges, who was shot in the back by the sniper at an Exxon station in Spotsylvania County. Some Matah advocates regard Bridges as a "modern-day Marcus Garvey," killed before he could carry out his work of economically empowering black America. Some Matah supporters believe Muhammad was under government mind control and that he killed Bridges in a conspiracy to stifle black economic power. They posted messages on UNN critical of its theories. "Believe it or not, there are people who believe that there is a conspiracy," Iman I says, incredulous. "They feel like everyone else was killed to shroud the killing of [Bridges], which to me is absurd." Ital Iman I, right, and Da.Uru I of Underground News Network say last year's sniper shootings were "like a message from a high priest. "Ital Iman I, left, and Da.Uru I of the Underground News Network view other journalists covering the sniper trial as "vultures who wish to see John Allen Muhammad hang from the gallows."